We had a lot of sailors in town, earlier this month. It was Fleet Week, here in Baltimore. 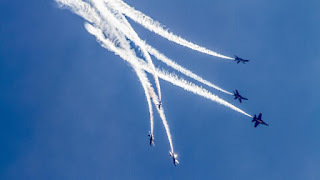 Saturday and Sunday, events were capped off with an air show featuring the Blue Angels. I don't know about you, but F-18's doing 600 knots, right down on the deck? There's something purely atavistic going on, the warrior gene, maybe, all that brute hardware, so disciplined and graceful. 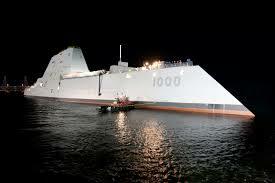 The really big deal, though, at least from the Navy's point of view, was the commissioning of the USS Zumwalt. It's a stealth warship, the first of a new destroyer class. There have been some issues, which leave room for discussion. First, some background. 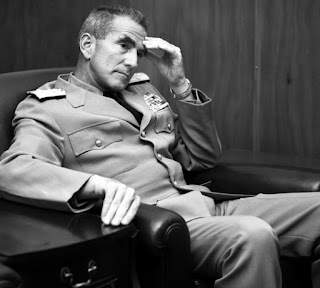 People of a certain age might remember Elmo Zumwalt, who was Chief of Naval Operations in the early 1970's. Zumwalt did his best to drag the US Navy, kicking and screaming, into the 19th century - with mixed results. He wasn't universally admired at the time. You have to realize the Navy has always been the most traditional, not to say hidebound, of the services. 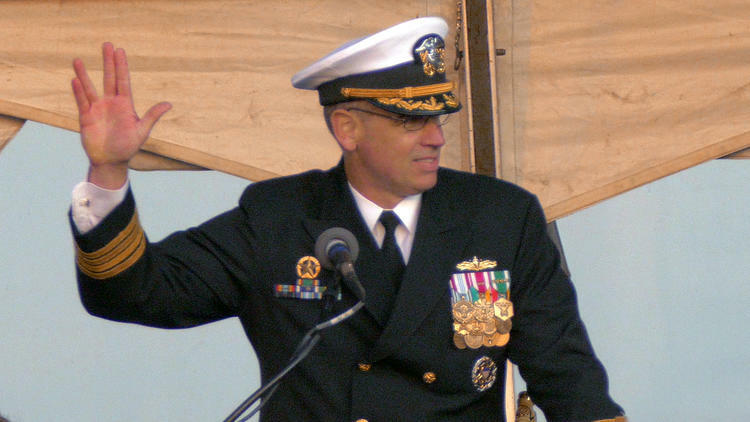 The admirals resist systemic change. They've probably waxed nostalgic on occasion for press gangs, rum, and flogging. Bud Zumwalt seriously tried to alter course, and combat the Navy's institutional racism and dogged resistance to women serving in billets previously restricted to men. His other major legacy is the Perry-class guided missile frigate. Back to the destroyer Zumwalt. These are larger ships than the conventional destroyer, displacing half again the tonnage - sorry for the techspeak - but designed to have a very low radar profile. You can see how different the hull shape is, looking at pictures, and the inverted bow. The superstructure's unconventional, no visible bridge or even antenna array. It's built to be frictionless in the electronic sense, with no recognizable signature. They say its footprint on a scope is the size of a torpedo boat. As you can imagine, the R&D wasn't without problems. Much of the modern battlefield is digitally rendered, and we have the example of the F-35 Joint Strike Fighter, whose development has been characterized as "acquisition malpractice." USS Zumwalt followed a path originally charted back in 1994, for a new class of surface combatant ships. The goalposts moved, budgets were cut, different war-fighting doctrines found or lost favor - in other words, there was twenty years of whose ox is gored. Given the necessary compromises, it's some kind of miracle that the Zumwalt was built (although there will only be three of them, in the end), and launched, and went through sea trials, and is actually entering service. It is, everybody admits, a real Space Age vessel. 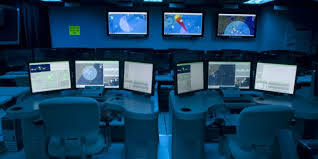 It's a nice irony, I was taking pains to point out, that Elmo Zumwalt, a CNO who was so vigorously opposed on so many levels inside the Navy (not too many old salts pissed off Hyman Rickover and lived to tell the tale), gets the ship of the near future named after him. It's appropriate, though. He would have gotten a kick out of it. Also appropriate. USS Zumwalt, the ship of the future, is skippered by a Navy captain named James Kirk. I kid you not. The guy has a sense of humor. At the Zumwalt's commissioning ceremony, Capt. Kirk said to the crowd, "Live Long and Prosper." Please Consider the Attached Story . . .